Sam Mortlock, who is a kind man, tells us that Sandringham church is so encrusted with royal associations that it is impossible to view it as one would any other parish church. On reading this, my old friend the late Tom Muckley spluttered that the reason it was impossible to view it is that it is so full of tourists, although Mortlock has the answer to that problem too, reminding us that while visiting the Estate is a joy in Spring and Summer, the best time to visit the church is probably a wet morning in early February. It was a hot morning in early August. I'd arrived here by bike from King's Lynn, thinking to get inside before all the crowds arrived. I'd already been to the churches at Castle Rising (but too early for the opener) and lovely West Newton, a church I have a particular fondness for. 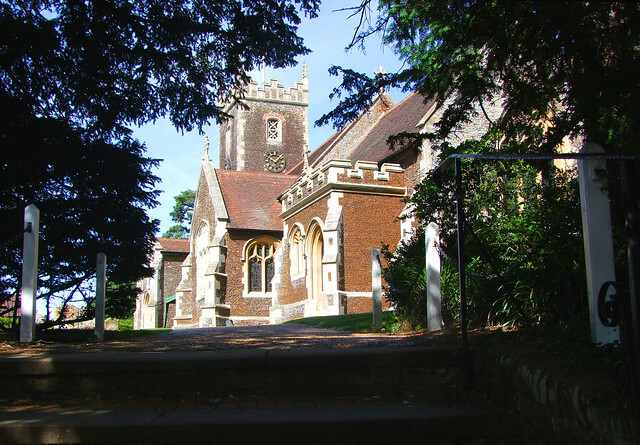 West Newton church sits in the Estate's largest and prettiest village, a mile or so from the House, but Sandringham church is in the heart of the Estate, a short walk from the House but enclosed in its own tree-surrounded churchyard. 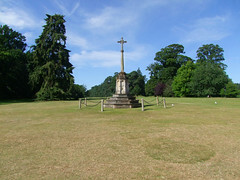 I turned down the long drive towards the House, checked with three police motor cyclists beside the village green that the church was where I thought it was, and cycled on past the war memorial and the ticket-booths. One of the Estate staff was walking towards me along the path from the church. After asking me to get off my bike (actually, what he said was 'would you kindly dismount, sir?') he told me that they didn't open the church until eleven, and they didn't even unlock the gates until then. It was only just gone ten o'clock, and he apologised, and seemed sympathetic to my plight, but of course he didn't offer to open the church early. I dare say that's not the sort of thing they do at Sandringham, I bet the whole place runs like clockwork. He went and sat in the ticket office and waited for the crowds, and left me standing by the locked lych gate. This was irritating, because I had plans for the day ahead and I couldn't afford to lose an hour. And there was something I already knew about Sandringham church - it is attended, and they don't let you take photographs inside. I don't know why this is. My main memory from visiting the church more than forty years ago is that there is a lot of silver, lots and lots of silver. Perhaps they don't want people photographing the family silver. Or perhaps they don't want people taking selfies in the royal pew. Or maybe it is for security reasons. Or most likely, they just want you to buy their postcards. Whatever the reason, it isn't allowed. Actually, the internet is awash with photographs taken inside Sandringham church, but it is always the same one, the shot up the chancel towards the silver. I expect this is the one photograph people get to take before the polite cough, the hand on their arm and the 'I'm terribly sorry sir, but photography is not permitted within the church'. If I had thought I would be allowed to take photographs inside then I might have waited - I might - and even knowing that I wouldn't I was still tempted, because the church is not just the sum of Teulon and Bloomfield's successive restorations. It has one of Norfolk's best sequences of early 16th Century stained glass saints, twelve of them in the upper lights of two of the windows. I don't suppose an exception would have been made for me to photograph them - although I couldn't help wondering if it might if I asked nicely - but they were the main thing I was interested in. But as photography of the interior was unlikely to be permitted to me, as the Estate staff would probably put it, and as it seemed daft to wait an hour just to take some closer exteriors, I took a shot from through the locked gates which will have to be enough for now, and I headed on to Dersingham. Behind me, the Estate began to gear itself up for another day of tourists. Many of these seemed to be Chinese, and I heard several people asking where the church was as I pushed my bike past the watchful eyes of the man in the ticket office, back to the road. I had read somewhere that there was now a lot of interest amongst the Chinese in the British Royals, so it wasn't surprising that so many of them were making it up here from London. Perhaps they wanted to know where the church was so they could see the font, which would be interesting to them for several reasons, not least because it was where Diana Frances Spencer, the future Princess of Wales, was christened in 1961. Maybe they even wanted to photograph themselves standing beside it, but of course they were going to be disappointed.